6 December 2018, Colombo. 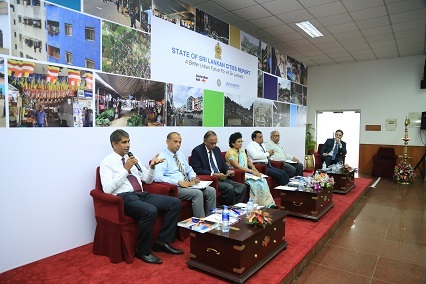 Today, UN-Habitat in partnership with the Government of Sri Lanka, launched the State of Sri Lankan Cities – 2018 report at a national event held at the Bandaranaike Center for International Studies in Colombo. Presentation of the Report by the UN-Habitat Country Programme Manager to the Australian High Commissioner to Sri Lanka. 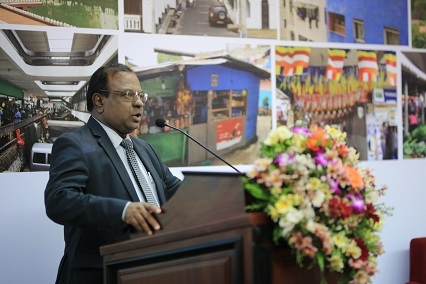 Since March 2017, the State of Sri Lankan Cities project has been implemented by UN-Habitat in close collaboration with the Ministry of Provincial Councils, Local Government and Sports, through the Sri Lanka Institute of Local Governance (SLILG) and the Local Authorities of the country’s nine Provincial Capitals. Funding for the project was provided by the Government of Australia. Mr. Kamal Pathmasiri Secretary to the Ministry of Provincial Councils, Local Government and Sports addressing the gathering at the launch. Mr. Kamal Pathmasiri, Secretary of the Ministry of Provincial Councils, Local Government and Sports, H.E. 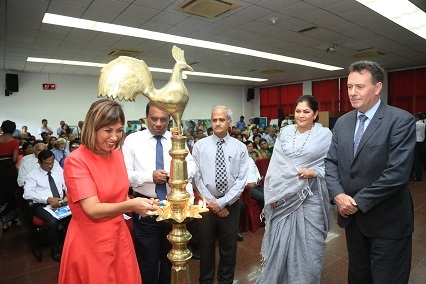 Bryce Hutchesson, the Australian High Commissioner to Sri Lanka, Ms. Hanaa Singer, United Nations Resident Coordinator and H.W. Rosy Senanayake, Mayor of the host city Colombo were amongst the distinguished gathering at the launch event. The mayors and chairmen of the other capital cities, as well as senior officials of the Government of Sri Lanka, representatives of Provincial Councils, Local Authorities, Civil Society Organisations, academia, development sector and UN agencies were also present. 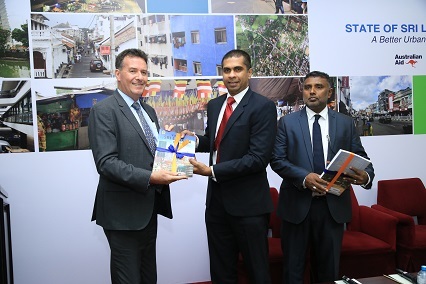 Following the launch, a panel discussion on the Report was held with the participation of senior state officials, heads of urban sector agencies and development practitioners in Sri Lanka chaired by Dr.Tom Davis of the Department of Foreign Affairs and Trade, Government of Australia. Lighting of the traditional oil lamp by distinguished guests. The “State of Sri Lankan Cities 2018” is the first ever comprehensive analysis of Sri Lanka’s nine provincial capital cities. The report draws on methodologies developed by UN-Habitat in other “State of Cities” reports to examine the ‘state’ of Sri Lanka’s major cities and highlight overall trends in the country’s urban development. It presents the latest spatial and statistical data and recommends a way forward for policy makers while creating a rigorous evidence base for better social, environmental and economic planning and programming for Sri Lanka’s cities. In particular, the Report highlights that Sri Lanka’s provincial capitals are larger and growing at a faster rate than previously thought; often urban growth has occurred outside municipal boundaries. The Report also highlights the important role of cities in driving social and economic development, both in the Capital, and in remote and less developed parts of the country with higher rates of poverty. Panel discussion on the report. The Report makes several key policy recommendations to achieve a better urban future for all Sri Lankans. The most important of these is redefining what is considered an ‘urban’ area and revising municipal boundaries to incorporate large fringe areas that are not currently counted as ‘urban’ in official data. This will ensure that the scale of Sri Lanka’s urbanization is captured in official statistics and represented in policy and planning. Other recommendations include developing a national and sub-national sustainable urban strategy, and linking this to enhanced urban research capacity, to promote sustainable cities.The report also highlights the importance of connectivity between cities, and their hinterlands, so urban opportunities are extended to a wide population and drive inclusive socioeconomic development.